Navigate to the web-based Health Dashboard. 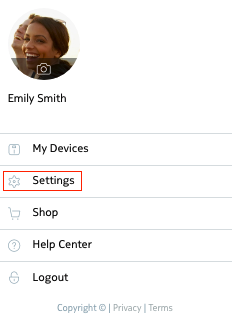 Click on your avatar in the top right corner and select Settings. Click on Download my data. You’ll get your data in the form of a CSV file, which you can open using any spreadsheet software. Activity: the date of the activity, steps, distance, elevation, and active calories. Blood Pressure data: heart rate, systolic and diastolic measurements, and comments. Weight: weight, fat mass, bone mass, muscle mass, hydration, and comments. Sleep: from/to (duration of sleep), light sleep, deep sleep, REM, awake time, and wake up. Body Temperature: the date of the measurement, body temperature measurement, and comments. You can also export height, oximetry, calories, environmental data (such as temperature, luminosity, etc) and screenshots (Home users only). Some data are specific to the Withings product you are using. Alternatively, you can click this link to export all your data at once.